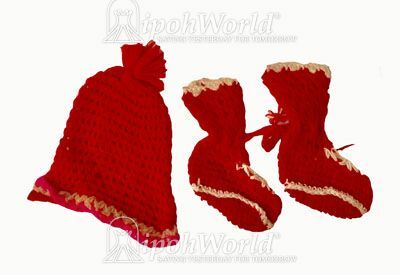 These matching baby boots and hat are crochet work made by a loving mother or grandmother for a young baby probably for his first Chinese New Year. To crochet is a process of creating fabric by interlocking loops of yarn, thread, or strands of other materials using a crochet hook. The name is derived from the French term crochet, meaning 'small hook'.